888-LOG-GUYS is the best in the log home restoration business! 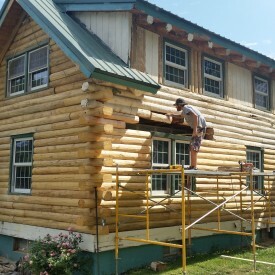 We will not only restore your log home, but we also specialize in log home repair, log home chinking and caulking, log home improvement, and log home maintenance. Let us be the one and only company for you when it comes to your log home care. We are ready to serve you in the Owensboro KY area! Use our number to contact us or request an estimate from our website! You may have noticed your stain peeling. You may have also noticed your log home or log cabin is weathered from the sun and rain. Ask 888-LOG-GUYS to restore your log home to its magnificent beauty! 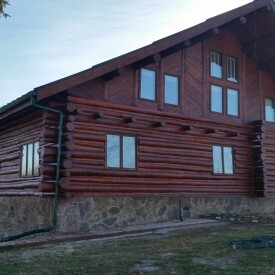 We use media blasting (corn cob, glass, sand, and walnut), sanding, borate treatment, and an energy seal (chinking or caulking) before finishing with the best product of stain to rejuvenate your log home or log cabin! Call us or ask for an estimate from our website! Your logs are becoming soft, and your logs have holes from bees or some other insect! Your logs are falling apart, but there is no need to panic! 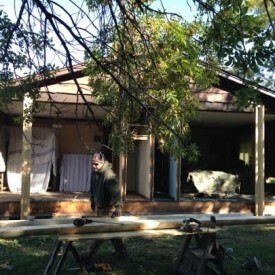 888-LOG-GUYS is here to rescue your log home or log cabin from damage. Our crew is no stranger to log repair or log replacement. 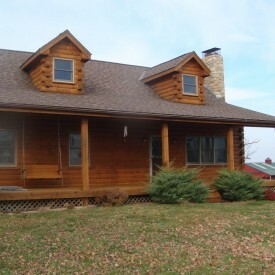 Choose us to fix your log home, and right away you will feel you are in the right hands. Not only will you be impressed with our professional service, but you will also save time and money! Our staff is waiting to hear from you to help you with your log home repair needs! You have had enough with all the bugs and insects invading your home! And what is going on with the air drafts by the window? And is that water leaking through your walls? Don’t put up with those annoyances anymore! Our company is ready to tackle your log home problems and restore your home back to cozy and comfortable. The 888-LOG-GUYS crew is ready to serve you in the Owensboro KY area. Call us or ask for an estimate online! Bet you didn’t know that we can also build or construct additions such as log railings, log staircases, decks, and porches and not just repair or restore log homes. 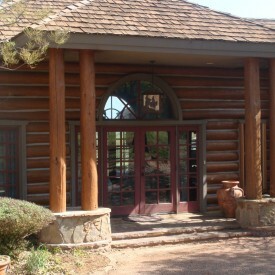 Let 888-LOG-GUYS improve your log home and increase its value. Your log home shouldn’t just be a house; it should be your dream come true! You can contact us by requesting a quote online or call our number for a free estimate! Once 888-LOG-GUYS restores or repairs your log home or log cabin, that won’t be the last time you hear from us! 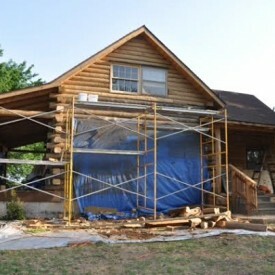 We will keep track of when your log home is due to be cleaned and re-coated. Even if you have not used our services before and feel like you need upkeep services, call us to get the job done! At a price you can afford, our company will preserve the health and beauty of your home! For your log home maintenance needs, call us today or send in a estimate request online!